If you’re in the market for a Windows 10 notebook with around a 13-inch display, then get ready to wade through some excellent choices. To make things easier, we took a look at the Dell XPS 13 vs. Microsoft Surface Laptop to see how one of our perennial favorites compares to a relative newcomer. The Dell XPS 13 has earned its special place in our hearts for its solid build quality, thin design, excellent components and performance, and superior battery life. However, the Microsoft Surface Laptop is a notebook that stands out in a very crowded field. Which one is worth your hard-earned money? Read on to find out. Dell’s XPS 13 design was perfected a couple of years ago and the company hasn’t messed with it since. The machine marked a real turning point in the industry as well, being the first to utilize thin bezels to fit a 13.3-inch display into a much smaller chassis. Today, the insides have kept up with the times but the exterior continues to use a nice combination of aluminum chassis and carbon fiber keyboard deck. At 0.6 inches thin and weighing 2.9 pounds with a touch screen, the XPS 13 remains one of the thinnest lightest, most well-designed notebooks you can buy. Microsoft chose to use an aluminum chassis for the Surface Laptop, with a twist. Alcantara fabric takes the place of metal for the entire keyboard deck, creating a very comfortable and luxurious surface. The Surface Laptop is also vibrant, with four colors to choose from — Platinum, Burgundy, Cobalt Blue, and Graphite Gold — and with matching accessories like the Surface Pen and Surface Mouse. The Surface Laptop is also incredibly thin at 0.57 inches and light at 2.83 pounds, in spite of packing in a larger 13.5-inch display, making it one of the thinner and lighter full-sized notebooks on the market. As we’ll see throughout this comparison, these are two closely matched machines. Picking a winner in this category is certainly challenging, given that both machines exude quality and have their own distinctive charm. The Surface Laptop has one potential flaw in its overall design and build — the Alcantara fabric could very well be susceptible to staining over long-term use, and it will likely require some extra special care to keep it looking new. For that reason, we’re awarding the XPS 13 the narrowest of victories. Both Dell and Microsoft chose solid processor and graphics components for their respective machines. The Surface Laptop can be equipped with either a seventh-generation Intel Core i5 or i7 processor, with the high-end option topping out at the Core i7-7660U. Graphics duty is performed by either Intel HD 620 graphics or the somewhat faster Intel Iris Plus Graphics 640. The Xell XPS 13 processor options range from the seventh-generation Intel Core m3, i5, and i7 CPUs, with the Core i7-7560U at the high end. Graphics options are similar with the Intel HD 620 graphics or Intel Iris Plus Graphics 640. In other words, the Surface Laptop and XPS 13 are likely to perform roughly identically, with the slightest nod to the Surface Laptop’s fastest CPU option. Both will perform just about any productivity task you can throw at them. Neither machine will be very good for all but casual gaming. Note that Dell has announced that eighth-generation Intel Core processors are coming to the XPS 13, so you’ll soon have a quad-core option in a very thin and light chassis. One area where the XPS 13 takes a performance lead is in storage speeds. While both machines use a the faster PCIe solid-state drive (SSD) interface rather than the older SATA interface, Microsoft’s choice of SSD and its implementation resulted in significantly slower performance in our review tests. Both the XPS 13 and the Surface Laptop have fast enough storage for typical productivity use, but the Dell is going to provide better performance if you work with large files. The Dell XPS 13 sports a solid backlit keyboard with decent travel and a firm bottoming action. The machine enjoys a smaller chassis but the keyboard nevertheless provides plenty of space between keys. The touchpad has an excellent feel and supports Microsoft’s Precision Touchpad protocol, which means gesture support is complete and reliable. Finally, there’s a 10-point touch display option. Windows 10 Hello password-less login support is provided by an optional fingerprint sensor to the right of the touchpad. Both machines, therefore, provide the expected modern notebook input mechanisms, and there’s not a lot to set them apart. Except for one thing — Microsoft built in support for the excellent Surface Pen, meaning that you can write on the display as long as you’re willing to use the other hand to keep things steady. Dell’s XPS 13 makes good use of its minimal chassis in terms of connectivity. There are two USB Type-A ports, a USB Type-C port with Thunderbolt 3 support, an SD card reader, and a 3.5mm headset jack. In other words, you have some options when connecting legacy or futuristic peripherals, and Thunderbolt 3 support means peripheral performance can be maximized. Microsoft maintained its stubborn refusal to adopt the USB Type-C format with the Surface Laptop, meaning that you’re limited to a single USB Type-A port, a mini-DisplayPort, a microSD card reader, and the usual SurfaceConnect port that doubles as a power connection. Microsoft may soon provide a SurfaceConnect to USB Type-C dongle, but that won’t provide the same level of support as the Thunderbolt 3 port on the XPS 13. This is a clear win for Dell, and hopefully, Microsoft will fully embrace USB Type-C with future Surface machines. In the meantime, the XPS 13 scores another win. The XPS 13 offers two very good display options, a Full HD (1,920 x 1,080, or 165PPI) panel and a QHD+ (3,200 x 1,800 or 276PPI) display. Both are good displays with acceptable contrast, strong color gamuts, and decent enough brightness. You won’t find the XPS 13’s display to be a detriment. The Surface Laptop, on the other hand, benefits tremendously from Microsoft’s apparent obsession with choosing excellent displays. The 2,256 x 1,504 (201PPI) might not be quite as sharp as the Dell XPS 13’s QHD+ option, but as usual for Surface machines, it offers superior contrast and excellent color accuracy. It also utilizes a 3:2 aspect ratio, meaning that it’s a bit taller and so better for productivity work — with the downside being some letterboxing when watching a video. 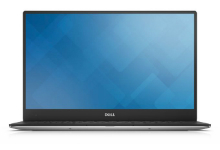 You can’t go wrong with the Dell XPS 13’s display. But if you want one of the best displays available in a Windows 10 notebook, and one that challenges the excellent MacBook Pro 13’s display, then the Surface Laptop is a clear choice. As mentioned earlier, the Dell XPS 13 and Microsoft Surface Laptop are almost equally thin and light, at roughly 0.60 inches and 2.7 pounds. The Surface Laptop’s chassis is a bit wider and deeper to accommodate the larger 3:2 display, but the difference is minimal. Either can be tossed into a backpack and carried around without major discomfort. In terms of battery capacity, the Surface Laptop fits in 47 watt-hours of power while the XPS 13 enjoys a significantly larger 60 watt-hours. When equipped with similar components, logic would dictate that the XPS 13 should enjoy longer battery life. As it turns out, Microsoft worked some magic with the Surface Laptop. Simply put, it roughly matched the XPS 13’s longevity, which was quite good at over 12.5 hours in our video looping test, for example. That makes both the XPS 13 and Surface Laptop longer lasting than their primary competition, Apple’s MacBook Pro 13, and both can last a full workday. Note that if you choose the XPS 13’s high-resolution display, you give up on some battery life. It’s hard to award a winner here, given that each machine is equally thin and light, and can last for close to as long away from a power source. Microsoft deserves some kudos for some serious optimization, while the XPS 13 is a slightly smaller machine overall. We have to call portability a tie. The Dell XPS 13 starts out $800 for a configuration sporting a seventh-generation Intel Core m3-7100U processor, 4GB of LPDDR3 RAM, a 128GB SSD, and Full HD non-touch display. It tops out at $2,200 for a Core i7-7560U, 16GB of LPDDR3 RAM, a 1TB SSD, and a QHD+ touch display. That provides a range of machines from relatively affordable all the way up premium levels. If you shop around, you can likely find discounts that can bring down the cost of your chosen configuration. Microsoft’s Surface Laptop shifts the range upwards a bit. It starts at $1,000 for a Core i5-7200U, 4GB of LPDDR3 RAM, and a 128GB SSD, and runs all the way up to $2,700 for a Core i7-7660U, 16GB of LPDDR3 RAM, and a 1TB HDD. That makes the Surface Laptop either just a slightly premium or an extremely premium laptop. Note that Microsoft still isn’t shipping all of the available colors in all configurations, so you might have to wait to get just the right combination. Dell wins here. You can max out the XPS 13 for $500 less, and buy the entry-level model for $200 less. To be honest, you can’t go wrong with either the Dell XPS 13 or the Microsoft Surface Laptop. They’re both excellent performers for just about any productivity task, they’re both easy to carry around, and they both will keep you working for a full workday. With that said, the XPS 13 costs less, and offers significantly better connectivity. Also, the XPS 13 comes out of the box with Windows 10 Home or Pro installed, whereas the Surface Laptop defaults to the more limited and locked-down Windows 10 S. If you don’t want to live with those limitations, then you’ll want to take advantage of Microsoft’s free upgrade to full Windows 10 by its new expiration date of March 31, 2018. Dell’s XPS 13 gets the nod here. The Surface Laptop is great, but provides less value overall.